The Mystic Hills Hideaway restaurant serves Chislic, fresh-ground burgers, prime rib, and BBQ pork ribs. 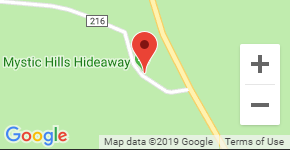 It is tucked into the woods and off the highway located at the Mystic Hills Hideaway ATV & Snowmobile resort 10 miles south of Deadwood on Highway 385 and 30 miles north of Hill City on Highway 385. Large groups of 20 or more please inquire about a special menu. Call 605-584-4713 for details. Hand cut seasoned and deep fried sirloin steak tips with Mystic seasoning. Includes a side of french fries. Burgers and baskets served with Sidewinder French Fries. Substitute onion rings for $1.50. Add a Wedge Salad for $2.50. No Substitutions on specialty burgers. Make it a buffalo burger for $2.50 or chicken for $1.00. ﻿Fresh ground sirloin, hand patted grilled burgers. Dinner specials served with wedge salad and baked potato or Sidewinder fries. Choice of dressing: Ranch, Dorothy Lynch, or Creamy Italian.